Eagan coach Mike Taylor was reviewing video from this season when, over and over, he kept noticing the same player dominating the screen – and the game. Frame after frame, there he was. No. 4. There goes No. 4 again. Hey, who is that No. 4? The game was against Edina. 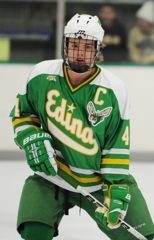 The player in question was Hornets senior defenseman Max Everson. As it turns out, the 6-foot-1, 190-pound Everson can attend pretty much any college (with a hockey program) he wants. Everson has had scholarship offers from several Division I schools and lists Harvard and the University of Minnesota as two of the programs on his short list. 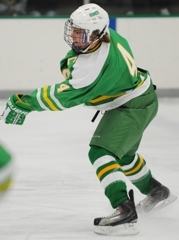 One of the state’s smoothest and most powerful skaters, Everson has a goal and five assists in the defending state Class 2A champion Hornets’ four games this season. The Hockey Hub recently caught up with Everson and asked him about his experiences playing for the U.S. National U-17 junior team, how he likes the newly renovated Braemar Arena and who he considers to be the Hornets’ biggest rival. 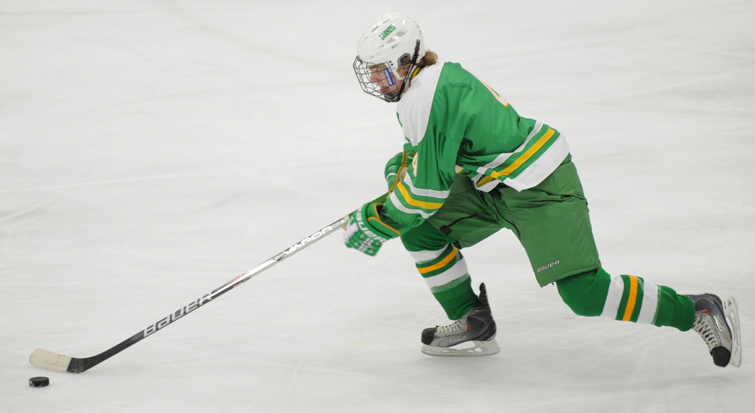 Speaking of rivalries, one of the state’s best will be renewed on Saturday, Dec. 18, at 8:30 p.m. when Edina and Eden Prairie square off during the Edina Holiday Tournament at Braemar Arena. Question: Best player you’ve ever been on the ice with? Answer: That’s a hard one…I’d have to say Rocco Grimaldi (from the U.S. National Development Team Program [Under-17 Team] - Univ. of North Dakota [verbal commitment]). I’ve never seen that combination of quickness and overall stick skills in one kid. It was unbelievable. He’s a small guy but he tears up the USHL. I think he’s going to North Dakota – he’s going to have a good career. He’s from California. Q: You spent part of the fall playing on the U.S. National Development Team Program’s U-18 team. What was that experience like? A: It was pretty good. It was an adjustment at first because we, me and Mario Lucia (Wayzata), were both there and we both had to figure out the school situation because we couldn’t transfer actual high schools. We actually had to do school work and contact our teachers and that sort of thing. But once we got in the swing of things there it was great. I mean, the hockey is unbelievable and they got a great coaching staff. The guys, there were five, four or five Minnesota guys already on the team so I knew that helped a lot going in, too. It was just a good experience, unbelievable hockey getting to play some DI-level games, getting to play some international and USHL. It was just a good overall experience. Q: You’ve already gone one-on-one a few times with your former UNDTP teammate Mario Lucia of Wayzata. What’s it like trying to shut him down? A: It’s different just cause he’s got a different style. He’s got great hands, obviously. It’s just like any guy with that amount of skill – you gotta make sure you watch the body or else you’re gonna look silly. Q: You got a chance to play a tournament in Sweden recently. How fun was that? A: That was unbelievable. It uh…playing against the Swedes was a great experience but even getting to watch other games like Sweden-Finland. The rivalry that they have is, that was like a cultural experience right there. Even the kids on the ice, they had a big bench-clearing brawl at the end of it and everything. All together that was just a great way to cap off the stint in Michigan. Q: How is your Swedish? A: “Tack” that’s about all I know. That’s ‘thank you’. That’s about as far as I got. Q: You’ve had a lot of colleges not only showing interest in you but offering scholarships. Where are you in that process? A: Right now I'm trying to get to the point at least in the next couple of weeks here where I can make a final decision. Most of the initial recruiting, that process is already happened with a majority of schools. I've got a few right now that, you know, that I feel like would be good fits. I just have to talk it over with my family and see what I think is best for me. A: Right now: Harvard, Minnesota and then I still haven't talked to many places like Yale, Princeton. Ohio State a little bit. Q: Would playing with your older brother, Marshall (at Harvard), be a factor or a non-factor? A: No that's a factor. Those are a couple of the best years of my life playing hockey with him here so I don't see why I wouldn't want to do that again if I got the opportunity. So that's definitely a big, big factor but I gotta make sure I go to a place I can enjoy for four years, too. Q: What are you looking for in a college and its hockey program? A: I want to be on a good team that contends to win the national championship every year. At least in that category. 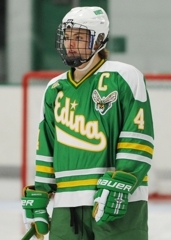 Just because growing up here in Edina, you get used to winning games and being in contention for championships and stuff and I dunno that's not really something I'm looking to go away from. I think it's more fun that way. That’s a big thing for me. Q: They’ve made some renovations during the offseason at venerable old Braemar Arena. What do you think of the changes? A: So far the ice is fast and the glass gives a little bit when you get hit which is an improvement. ... you won’t be bouncing back into our own zone any more. Haven’t played a game yet. 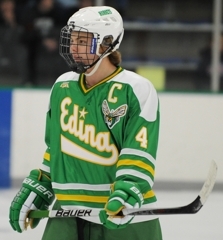 Tomorrow (Dec. 2 against Burnsville, Edina won 5-4 and Everson contributed a power-play goal) we’ll give it a test run. Q: You’ve got some teammates who can fly. Can you keep up with guys like Michael Sit and Ben Walker, or do you have to use other methods to slow them in practice? A: (laughs) Uh...no...that's...yeah other methods. I use my stick a lot. I chase them around and hack them. Q: Your coach, Curt Giles, is a former NHL defenseman who was famous for his devastating hip check. Has he taught you the ins and outs of a hip check? A: The hip check itself, no. But how to get yourself in the position to hip check or a regular check - he's given us bits and pieces there. I mean, he doesn't want us going out and killing anyone, obviously, if it's going to be illegal. He helps with the defense, all defensive aspects of the game. Q: Who do you consider to be Edina’s biggest rival and why? A: Two options pop into my mind when you say that. Eden Prairie and Minnetonka would be the two I would say. Minnetonka more recently in the high school years just really become the big, because past three years ... it was always us-Minnetonka vying for the Classic Lake championship. But also Eden Prairie from the youth programs. That was always the big District 6 matchup. They have a good group our age so we developed a good rivalry with them, too. 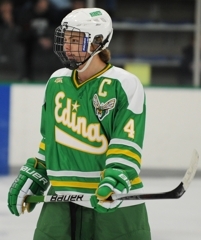 Q: After years of fun battles during the Edina Holiday Tournament, Edina and Eden Prairie are now in the same conference. Does that add more to what was already a heated rivalry? A: It definitely should. I mean, every year the Holiday Tournament here, packed house, it’s almost a guarantee, Friday night, 8:30. That’s one of the ones you look at on the schedule at the beginning of the year and you just, that’s the one you’re waiting for. Now we’re playing them three times. I would just assume it would be that atmosphere and that type of game just twice more. And you gotta get excited about that. Q: Do you get sick of playing Eden Prairie? A: They’re great guys off the ice but not friends on the ice. Credentials: Everson has a goal and five assists this season in four games and was a key cog in the Hornets' run to the state Class 2A championship last March. He played in the Upper Midwest High School Elite Hockey League this fall until he was beckoned by the U.S. National Developmental Team Program to play as an injury replacement for the U-17 national team. College committment: Everson committed to Harvard University on Monday, Jan. 10, where his brother Marshall plays. He reportedly received interest from the University of Minnesota and Ohio State among others prior to his decision. Favorite way to spend a Sunday afternoon: I like to watch football on the couch. Craziest thing you’ve ever done: That’s another good one…I dunno. Last book you read: I can’t remember the name…It was ‘Feed’ for school.